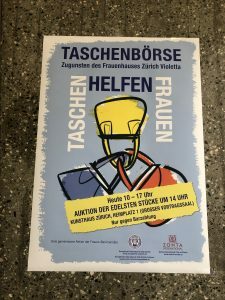 The project involved organizing a large sale of bags to support a women’s shelter / house in Zurich called Frauenhaus Violetta. This shelter offers 24 places for women victims of violence with and without children. The offer includes emergency housing, protection and security, psychosocial counselling, legal information and networking. The women’s shelter thus provides a framework for psychic stabilization and trauma coping. A major campaign in the local media helped promote the outstanding work and involvement of Soroptimists in eradicating violence against women and girls.